This tool will help brewers organize and document everything they need to brew successfully using all-grain techniques. Without keeping good records you have no way of replicating results or troubleshooting a bad batch. Print out the PDF document and use it to setup your ingredients, mash schedule, and hop schedule. Use the calculators at this site to find batch statistics which are useful for comparisons later and plan our your mash schedule if you are doing infusions. Record hydrometer (specific gravity) readings after lautering, after the boil, when you rack, and before you bottle. 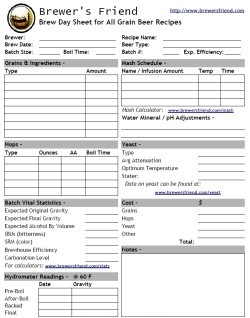 Designed for use with the all grain brewday checklist and BIAB checklist. Please let us know if you have feedback so we can make this better!